Ed Moro, chef and owner, opened the eponymous restaurant with his wife, drawn to the Finger Lakes winemaking region after years of working in the Napa Valley. After more than four years in its current location on Auburn’s East Genesee Street, Moro’s Table continues to plug along. The Wife and The Aunt started with the crab and shrimp cakes. Light on filler and served over a light remoulade, The Aunt said it was perfectly cooked and very crispy. 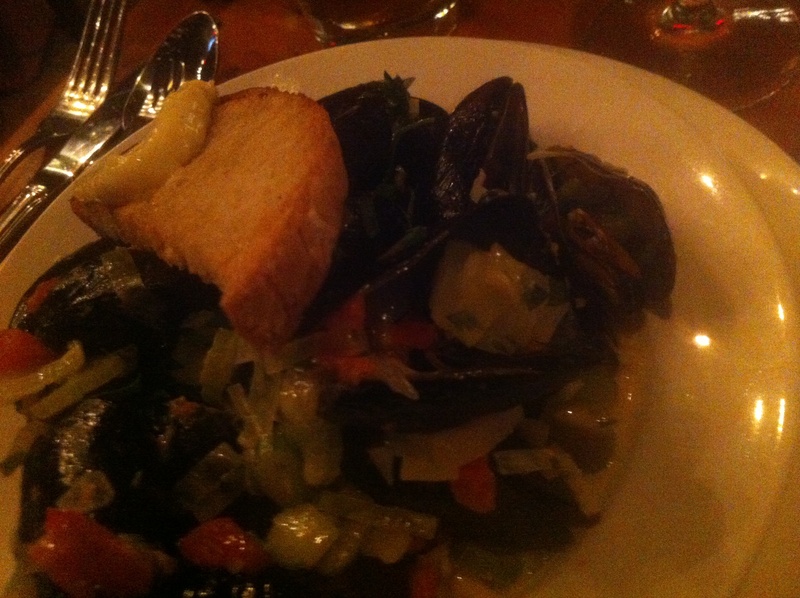 I opted for an order of mussels prepared with pernod, fennel and garlic. The mussels were a little skimpy on meat, but the broth was overwhelmingly good. So good that our waitress had to make a second trip with bread to mop up the liquid. 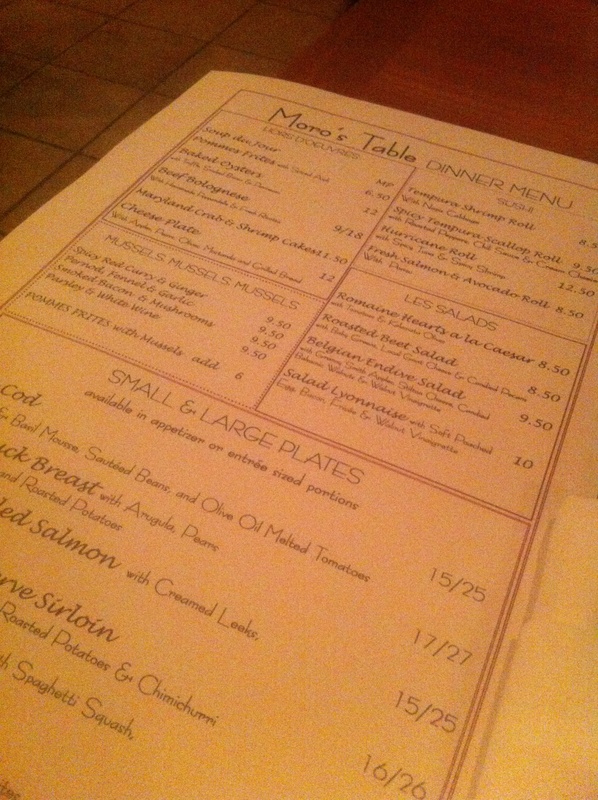 Moro’s small plate/large plate menu included three fish dishes — cod, salmon and scallops — as well as a steak, a hamburger and a duck breast. Served over roasted potato slices and topped with a sour cherry sauce, the generous portion of the large plate was prepared — by request — to the chef’s preference. It was presented medium-rare, with a beautiful pink and red hue. The typically fatty meat was completely lean with no waste. 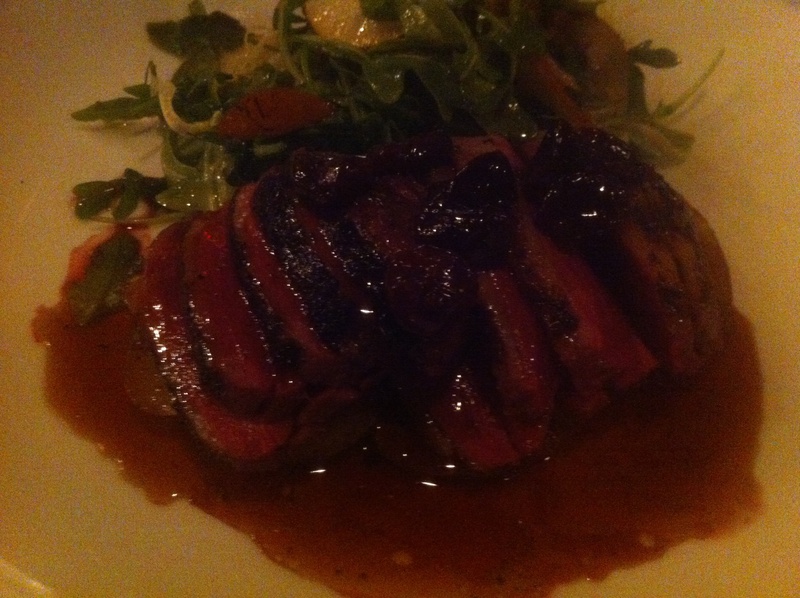 It was served with an arugula and pear salad. The Aunt’s cod was prepared with a zucchini and basil mousse and served with sauteed green beans and tomatoes. 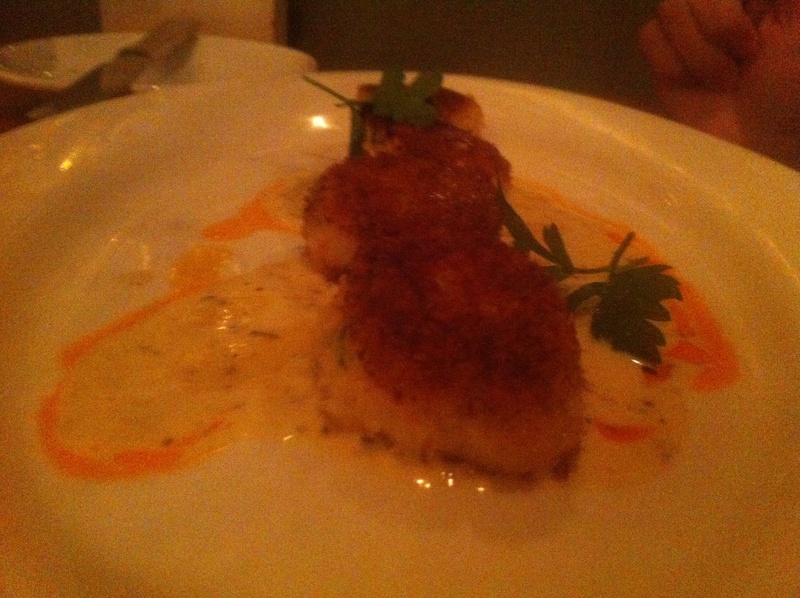 The Wife described her pan-seared scallops as the best she had ever tasted. 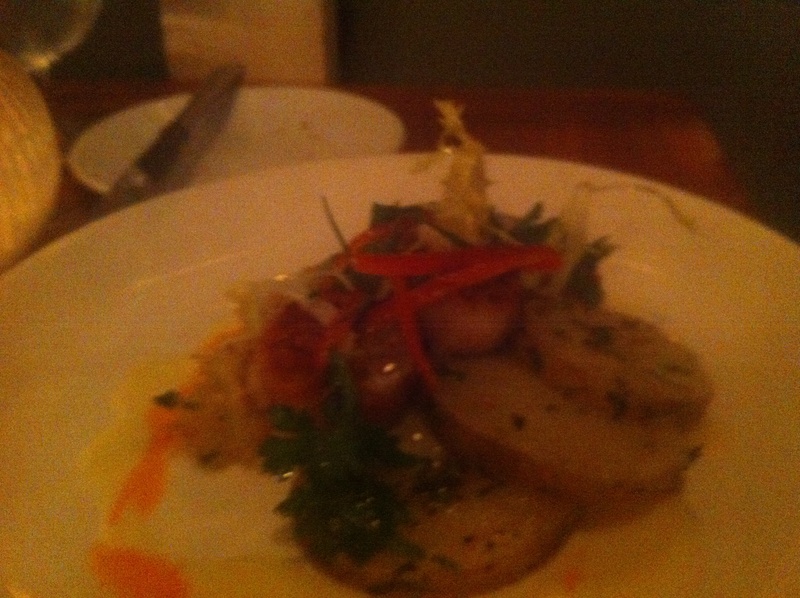 The bay scallops were presented with spaghetti squash and roasted potatoes, and finished with a chili-infused oil. Both of them found the small-plate portion to be the perfect size for their appetites, which had dessert in mind. A separate menu of desserts and after-dinner drinks came out after our entree-course plates had been cleared. Six desserts, ranging from homemade madeleines to creme brulee, are made by the in-house pastry chef. The Wife opted for the creme brulee, which was served with fresh berries and an extra-thick sugar crust. The Aunt and I ordered the warm chocolate cake. The molten hot chocolate interior was offset by the scoop of bourbon-flavored ice cream over the top. 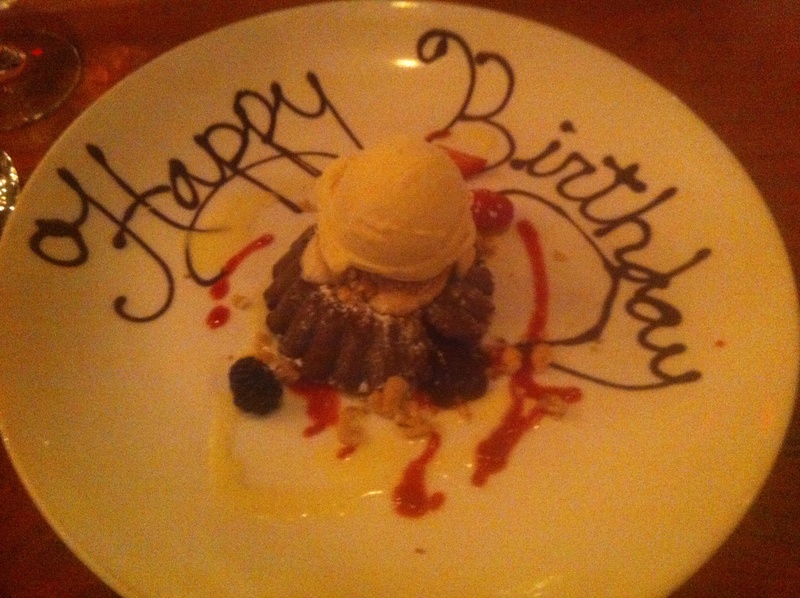 It was less of a cake and more like a small thin-crust pie filled with hot fudge. The lesson learned from dinner at Moro’s? Do a better job of planning ahead so that getting a table becomes less of an impossibility in the future. Moro’s Table is located at 1 East Genesee Street in Auburn. Parking is in the municipal lot behind the building. Reservations are accepted for dinner Tuesday through Saturday from 5 to 9 p.m. Dinner for three with beverages was $153 before gratuity.